Gemstone chips come in a wide variety of colors and designs. Their irregular shape and earthy appearance make them appealing for use in jewelry. Love earrings, but hate spending money? Rather than pay the high prices associated with bohemian-chic earrings, make your own. 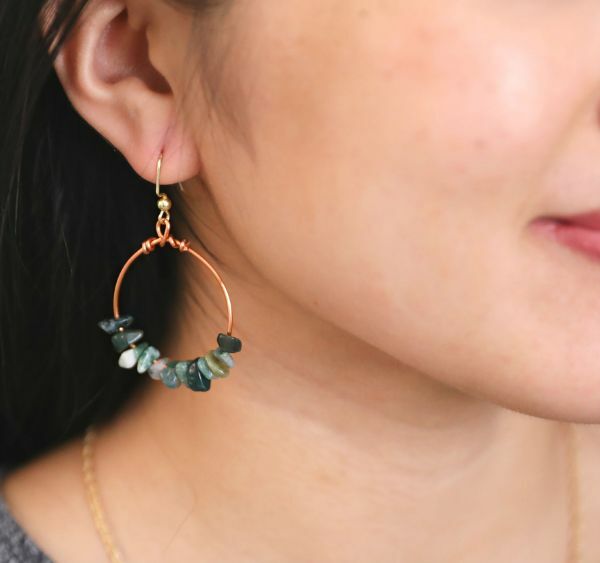 Create copper wire hoop earrings that display gemstone chips. The process is so simple, you'll likely end up making numerous pairs of these earrings. Twist copper wire with wire cutters, as shown in the video, or use pliers to bend and twist the metal. 1. Cut approximately 6 inches of copper wire from the roll. 2. Place 14 gemstones on the copper wire. 3. Hold each side of the copper wire, and bend it upwards to form a circle. The top of the wire should overlap to make an "X" on top of the circle. 4. Work with the exposed wire on top of the circle. Slip the bottom of an ear wire over the copper wire that points to the right of the circle. 5. Twist the copper wire under and over the circle to secure the ear wire. Continue twisting the copper wire until it's completely wrapped around the circle. 6. Cut exposed sharp ends with wire cutters. 7. Twist the copper wire that points to the left above the circle. Continue twisting the wire until it's completely wrapped around the circle. 8. Cut off sharp ends with wire cutters. The earring is complete. 9. Repeat steps 1 through 8 to make a a second earring for a matching pair. 10. 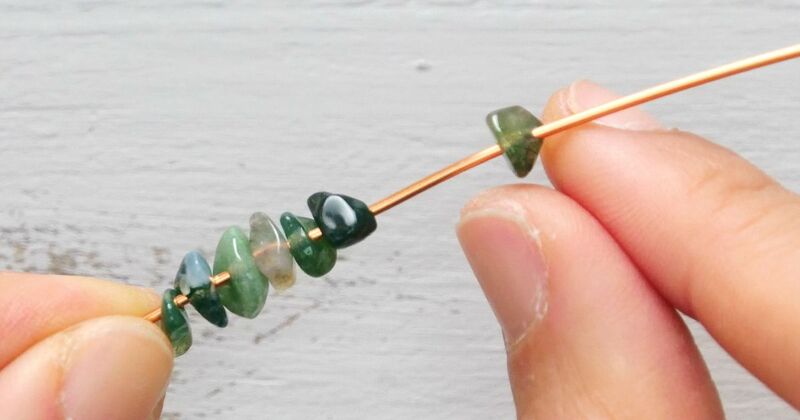 Slip the ear wires through ears to show off your new, DIY gemstone chip earrings.